Your motorcycle should be in good condition so as not to present a hazard to yourself and other participants at TRAKDAYZ. Although we try to assist where possible with faults detected during scrutineering, if your machine is in a dangerous condition it will not be allowed on the track. This guide is a good place to start for items to check or repair however the most common issues we find at scrutineering time are with tyres and brakes so pay special attention to them. Now is not the time to try to use the last millimetre of tread on old tyres. Tyres should be in good condition (no cuts or tears) with visible tread above the wear indicators and ideally should not be squared off. Tyres should be properly inflated - correct pressure for the type of riding in your session can be discussed with your coaches at TRAKDAYZ. Your brakes will get a good workout and will heat up to tempe ratures they don't normally see on the road, so ensure that there is sufficient material left on the brake pads (particularly front brakes). It is a good idea to check the brake fluid as well, if it is old or discoloured it should be changed, make sure there is no air in the system (the lever action should not be spongy). If you have any doubts about the condition of your tyres or brakes pads then they probably need to be renewed. There are no visible oil or coolant leaks. There is nothing obviously loose, worn or likely to be a hazard. 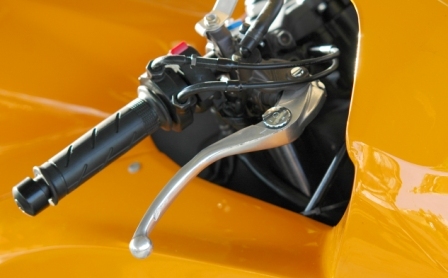 Once your bike has passed scrutineering, we will also require that your speedo is covered, your mirrors are removed or taped over, and your brake light is taped over. If you have a glass headlight then that will also be taped. If you wish to tape these item yourself, then once checked, that should suffice, otherwise the scrutineer will do this during the scrutineering process and before he places the dated scrutineering sticker on your bike. All tape used will be of such a compound as to not allow light to pass through. If you are unsure or this is the first time at the track then it is best to leave your suspension on the standard settings that you are used to on the road. If you are in Group 3 or 4 and feel adjustment is required, the coaches can help.